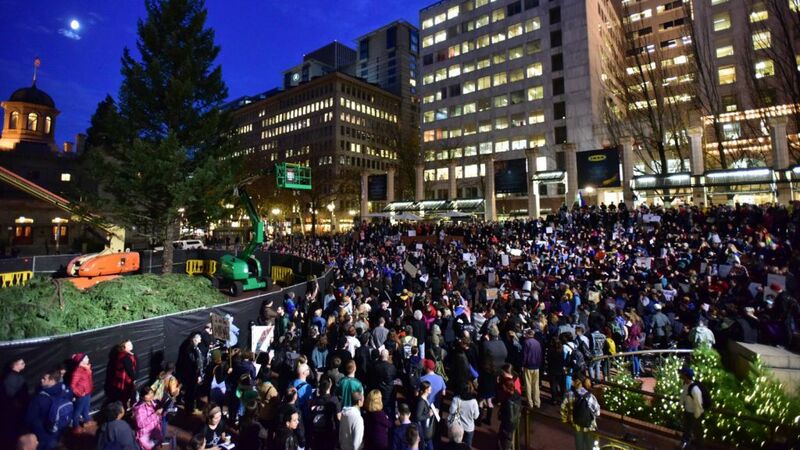 PORTLAND, Oregon (AP) — Another night of nationwide protests against Donald Trump’s election came to a head in Portland, where thousands marched and some smashed store windows, lit firecrackers and sparked a dumpster blaze. 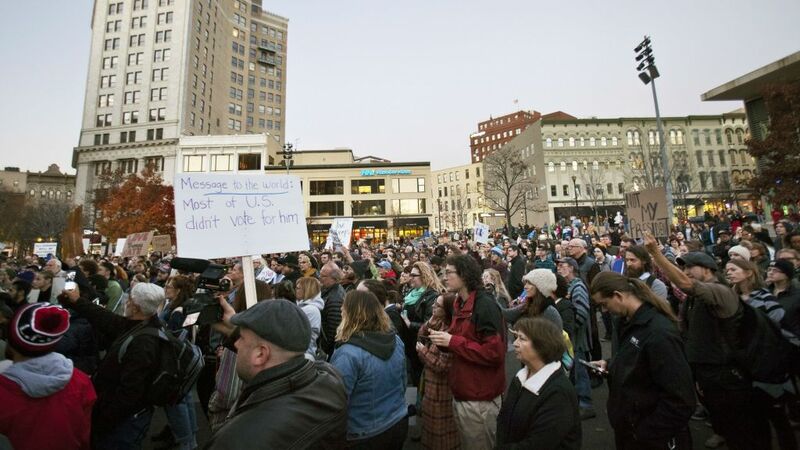 Police termed the protest a riot and used “less lethal munitions” to help clear the streets. Officers began physically pushing back against the crowd that at times threw objects at them as midnight approached, arresting several people and using flash-bang devices and types of smoke or tear gas to force people to disperse. After several orders to leave, police said officers used “less lethal munitions,” such as pepper spray and rubber projectiles. Live video footage showed officers firing what appeared to be the non-lethal items. It wasn’t immediately clear if anyone was hit. 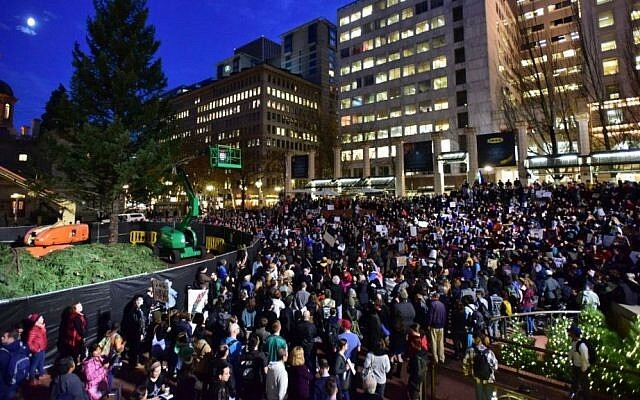 Around the country from New York to Chicago to California, in red states as well as blue, hundreds of demonstrators marched through streets, many for the third straight night, though in somewhat smaller numbers. 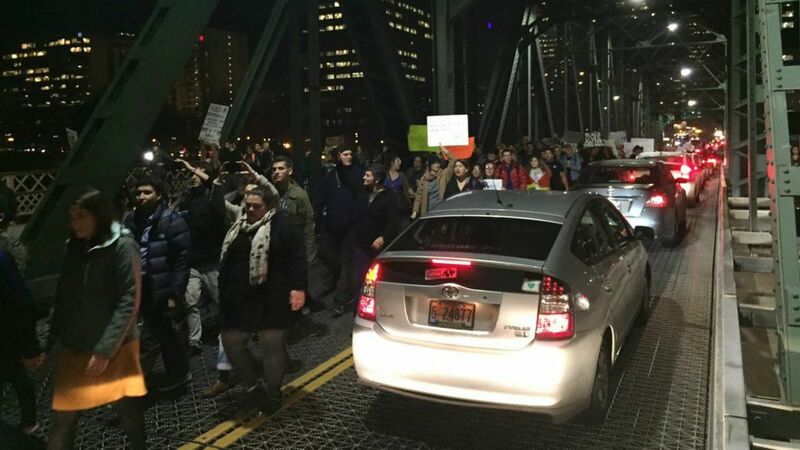 In Denver, protesters managed to shut down Interstate 25 near downtown Denver briefly Thursday night. Police said demonstrators made their way onto the freeway and traffic was halted in the northbound and southbound lanes for about a half-hour. 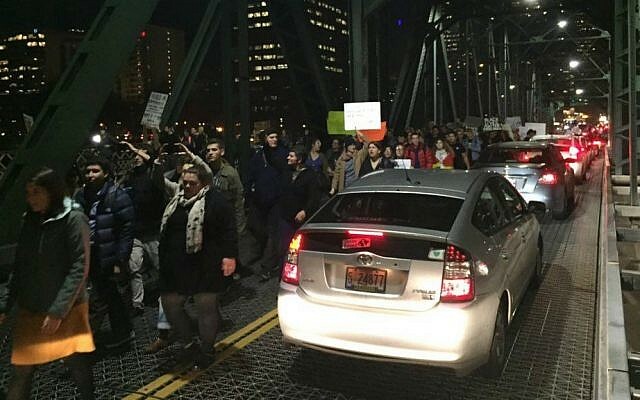 Protesters also briefly shut down interstate highways in Minneapolis and Los Angeles. 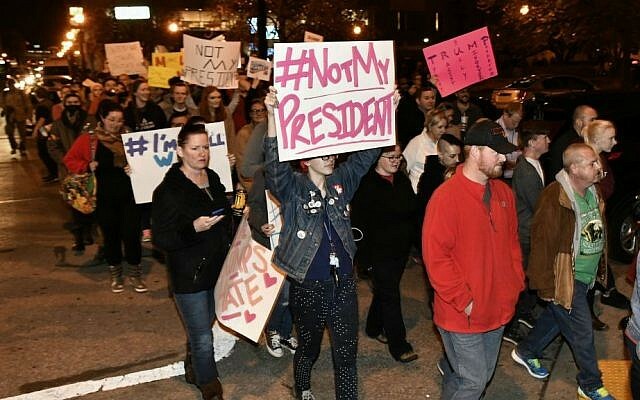 In San Francisco’s downtown, high-spirited high school students marched through, chanting “not my president” and holding signs urging a Donald Trump eviction. They waved rainbow banners and Mexican flags, as bystanders in the heavily Democratic city high-fived the marchers from the sidelines. In New York City, a large group of demonstrators once again gathered outside Trump Tower on Fifth Avenue Thursday night. 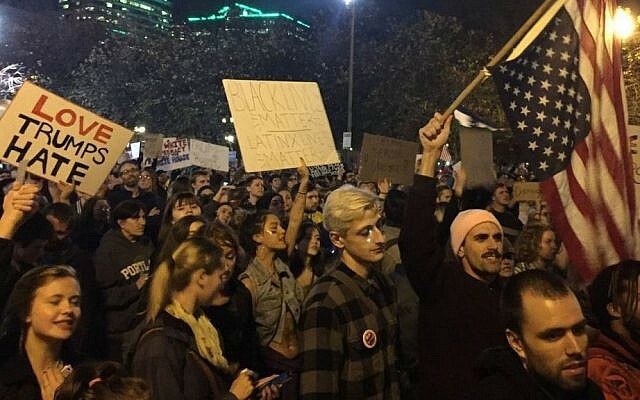 They chanted angry slogans and waved banners baring anti-Trump messages. 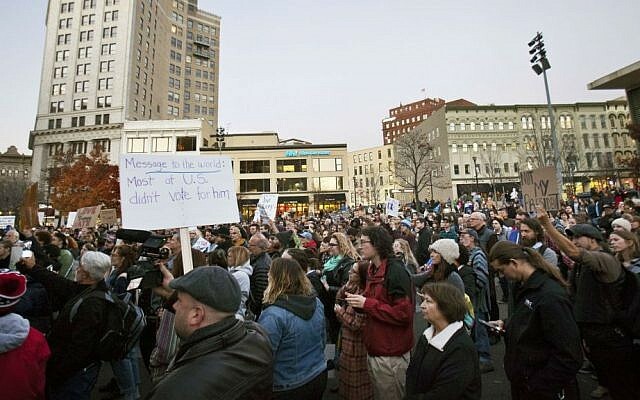 About 500 people turned out at a protest in Louisville, Kentucky, and in Baltimore, hundreds of people marched to the stadium where the Ravens were playing a football game. Hundreds of protesters demonstrated outside Trump Tower in Chicago and a growing group was getting into some shoving matches with police in Oakland, California. 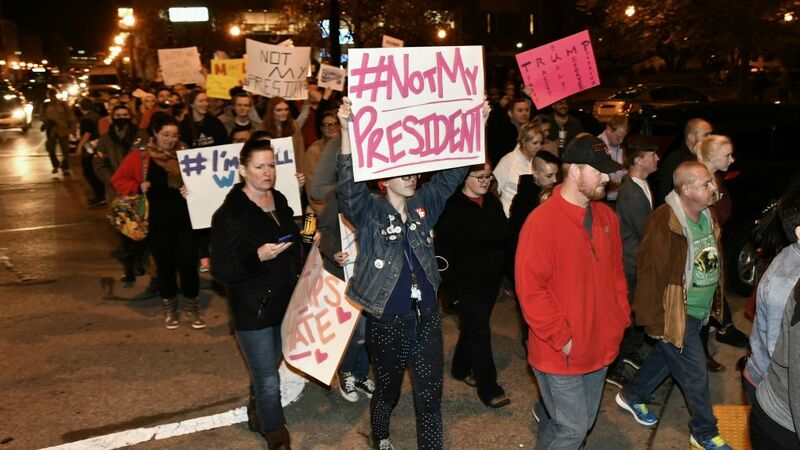 As expected, the demonstrations prompted some social media blowback from Trump supporters accusing protesters of sour grapes or worse, though there were no significant counter-protests. 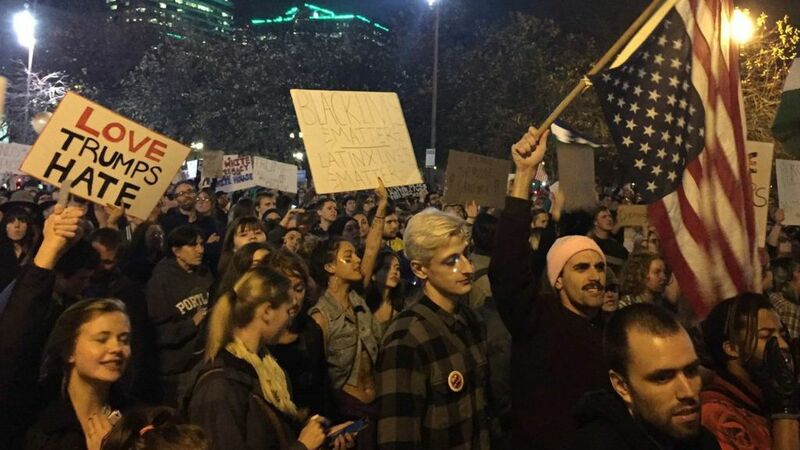 Trump supporters said the protesters were not respecting the democratic process. 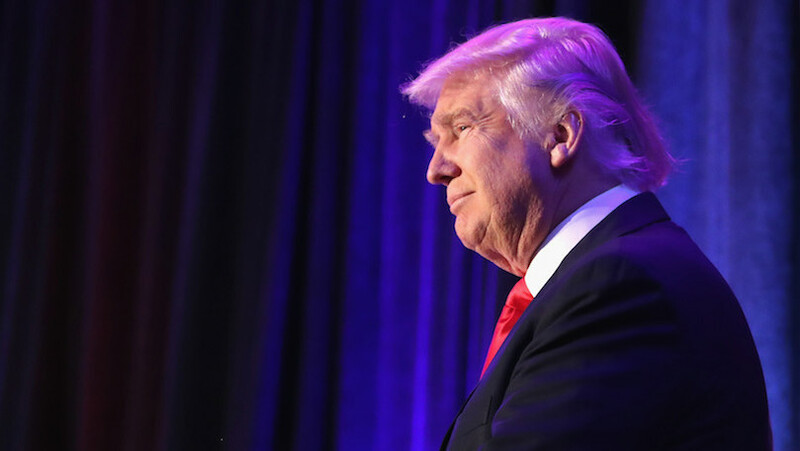 As of Thursday, Democrat Hillary Clinton was leading Trump in votes nationwide 47.7 percent to 47.5%, but Trump secured victory in the Electoral College.